Bouillabaisse (pronounced "BOOL-yuh-bayz" or "bool-yuh-BAYZ") is a classic French fish soup from the French region of Provençe on the Mediterranean coast. Traditional bouillabaisse is made with various fish and seafood, such as rascasse, scorpionfish, red mullet, and conger, as well as crustaceans like spiny lobster and crab, native to those waters. The further from that region one travels, the greater the likelihood of encountering bouillabaisse that features cod, snapper, halibut and shrimp. Bouillabaisse includes various vegetables, herbs, and spices, including tomatoes, onions, leeks, garlic, fennel, orange peel and bay leaves. One particular spice, however, is absolutely crucial, and that is saffron. Sadly, saffron tends to be one of the ingredients cooks will seek to substitute, owing to its cost, resulting in a proliferation of bouillabaisse redolent of turmeric and paprika—which is to say, inferior bouillabaisse. It's a shame, too, because even though it's expensive, you only need a minuscule amount of saffron to impart both its unique flavor and aroma to a bouillabaisse. If restaurateurs were a trifle less miserly, and tourists a smidge more discerning (because the two go hand-in-hand, as restaurateurs will only commit forgery when they can get away with it), we may well not find ourselves at such a pretty pass. And yet, here we are. In the traditional method of serving bouillabaisse, the broth is presented in a bowl, along with toasted rounds garnished with a sauce called rouille—which is similar to aioli—with the fish and seafood presented on a separate platter. Modern bouillabaisse is served with all the ingredients together in a single bowl. Some version of bouillabaisse—which, when properly prepared, is a soup, not a stew—is served everywhere along the Mediterranean coast in France. Aficionados consider the bouillabaisse served along the stretch of coast from Marseilles to Toulon to be the one true bouillabaisse. This finicky attitude is uniquely French and as such, not to be lightly dismissed where the merits of French cuisine are concerned. With that said, the bouillabaisse in Cannes or Nice will be fine. Not so in Paris, however, where, if it is to be had at all, it will invariably take the form of a nondescript orange-hued fish stew topped with a crouton. The chief difficulty in preparing bouillabaisse is that the various types of seafood have different cooking times, with crustaceans, for instance, taking longer to cook than the more delicate-fleshed fish. This means they must be added in stages. Once cooked, which takes no longer than 15 minutes in total, bouillabaisse needs to be served right away. There can be no cooking it in advance and holding it for service. It's a similar conundrum to that of risotto, and in both cases, most restaurant patrons end up consuming a version of a dish that can fairly be described as an impostor. One secret to making a superior bouillabaisse that most restaurants do not employ, (but there's no reason, other than the additional effort, that you couldn't) is to use lobster stock as the base of the soup. The shells of crustaceans are incredibly flavorful, and lightly roasting and then simmering the shells of a lobster (or indeed of shrimp) along with the appropriate herbs and aromatics, will produce an extraordinarily flavorful stock which you can put to many a good use—homemade bouillabaisse being just one. Another reason to save those shrimp shells. 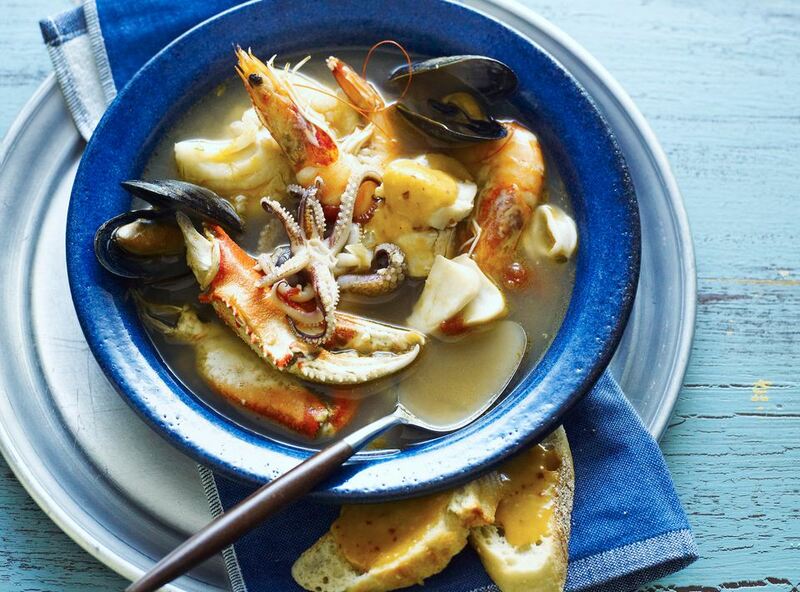 Here's a recipe for a traditional Marseilles bouillabaisse.